Saw my hero, Julio Franco, yesterday. He’s going to turn 49 next week but hasn’t let his age keep him from his passion — baseball. I wrote about him last year when he became the oldest baseball player to hit a home run. 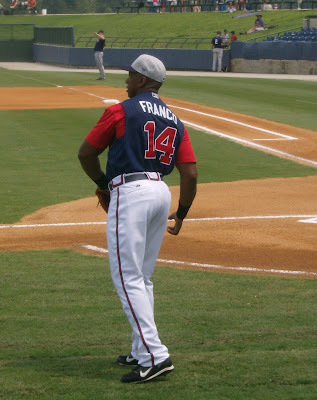 Franco’s playing for the Atlanta Braves’ Single-A, minor league affiliate in Rome, Georgia. He’ll likely rejoin the major league Braves on Sept. 1 when the rosters expand to 40-man teams. In yesterday’s game, Franco hit an RBI single for the first run of a four-run inning. Not bad for 48 years old. I hope he helps the Braves get to the World Series this fall. Of course, Franco says this won’t be his last year — he dreams of playing at age 50. I’m sure he’ll do it.